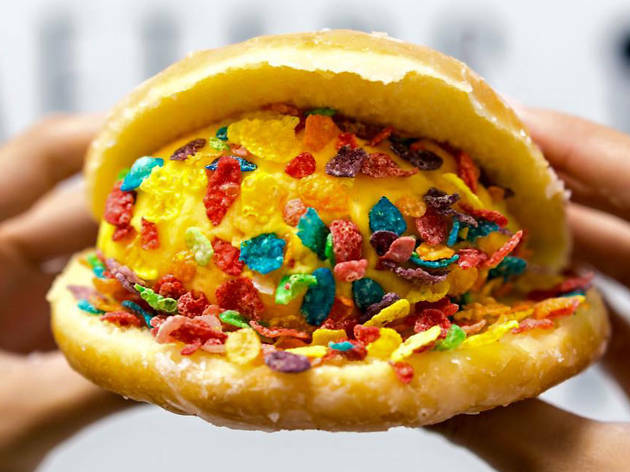 Afters Ice Cream may have lines around the block at each of their stores, but for good reason: their milky buns filled with ice cream and sprinkled with crazy toppings are as addictive as they are delicious. Choose from handcrafted ice cream flavors like Cookie Monster, Banana Walnut Fudge and Jasmine Milk Tea. I avoided trying Afters for awhile due to long lines and the perception that the flavors were too cloyingly sweet (between the donut buns and the "cookie monster" type options). Once they started their Hello Kitty promotion, I had to give it a try. Yes, the lines were long and it was a hot day, with the ice cream melting super fast. But I was pleased to find flavors like jasmine tea and Vietnamese coffee, which would appeal more to my "adult" tastes. I tried the Hello Kitty flavors and loved the Strawberry Shortcake. It's made with real strawberry puree which one can taste. I ultimately went with the milk and cereal flavor on a cake cone. They rolled it in their house made corn flakes which gave it the texture and sweet/salty kick it needed. Despite the long lines, the staff was super friendly and offered samples of anything I wanted to try. The ice cream melts rather quickly, but how long is it going to last anyways? Really unique ice cream flavors here, as well as toppings galore!! The crowd favorite Cookie Monster (colored blue like the famous Sesame Street character) is delicious if you like sweet flavors. 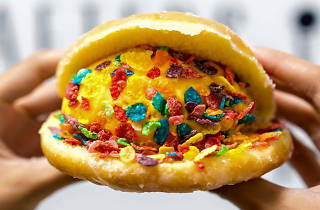 The milky bun is great if you like donuts, but be sure to eat it quickly because the second the ice cream melts, it gets super messy super fast! There's usually a line but service is quick and efficient. The roped-in line and engineered-for-Instagram aspects of this place sure are annoying. But why am I complaining about ice cream wedged between two halves of a donut? Is it the greatest dessert ever? Nah. But it's pretty damn good.